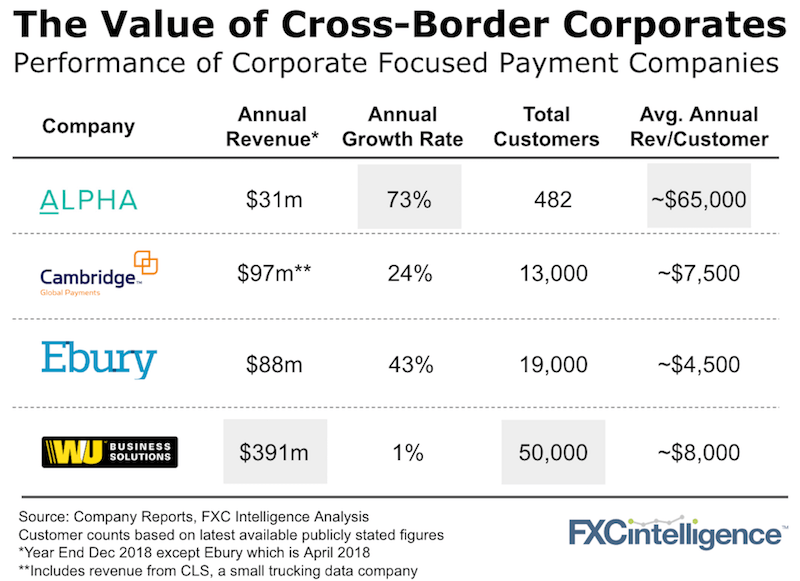 The best performing players in corporate cross-border payments are showing why it is such an attractive segment. Alpha FX and Ebury, two of the leading players focusing on corporates reported their annual results this week. They followed results from both Cambridge and Western Union Business Solutions (WUBS). To analyse this group, we have attempted to harmonise the key metrics for each of the companies above as they all report their financials differently. Only 11% Alpha’s revenue is from spot payments. Ebury’s accounts show a big increase in hedging. Specialist forwards is also a core product set of theirs. (See our Ebury’s CEO interview for much more here). Neither Cambridge or WUBS supply any break-out information on this but risk management is a core offering. Alpha’s average annual revenue per client reflects its focus on mid-market corporates, not SMEs. Our previous analysis has shown how highly the market values this. All of the companies above rely on humans to sell their services. Digital acquisition of any corporates other than small business remains a challenge. A look at WUBS’ stagnant performance versus its peers shows it’s not all tailwinds. This is alongside the numerous successful consumer Fintechs who are trying to enter and grow the corporate space too. What is clear is that the products and marketing skillsets for corporates are very different from those for consumers. Trying to win at one is hard, trying to win at both may be impossible. Consolidation is picking up in all parts of the Fintech and cross-border value chain. Stay tuned.